Scissors, ruler, tape measure, chalk pencil, tracing paper, and hand needle. Basic craft supplies available to purchase at store and your choice of Amazing Fabrics. This sewing class is $25 for the 2-hour course. Be on the lookout for future classes! Fabrics That Go is Tucson's #1 Local Fabric Supplier, with over 10,000 bolts of fabric to choose from! Exciting one-on-one teaching! This event is $25 for the 2 hour course and seeks to bring The Tucson Community together through creativity! Ginny will be teaching beginner to intermediate sewing. Learn the proper way to operate a sewing machine and how to utilize it to accomplish basic stitching. We'll be making a Birdie Sling, as shown in the picture. We have many fabrics to choose from! 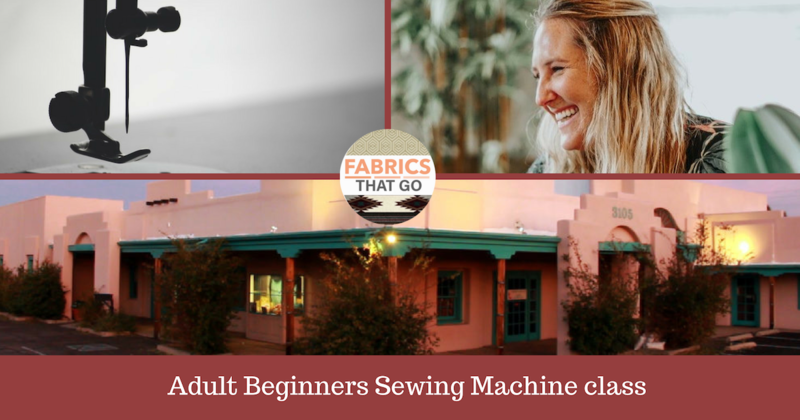 We love getting to know our Tucson Community, and look forward to spreading the love of Sewing and Arts & Crafts. Get to know others in our community with similar interests & learn fun skills that you can share with your family.